catch you later. good night. thank you for your cooperation from around the world. 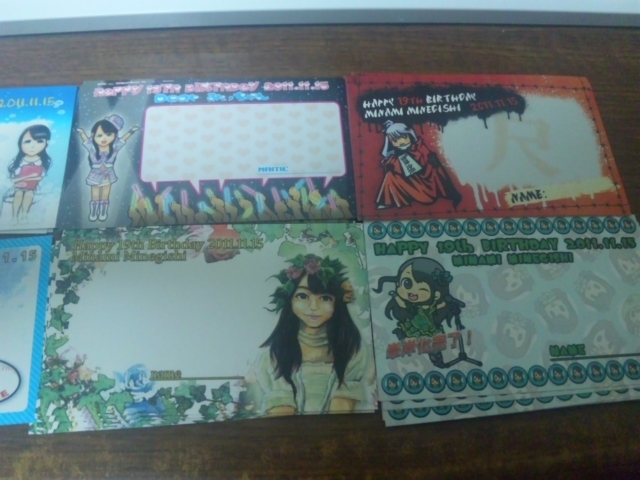 Birthday cards collection 2011 for Michan! 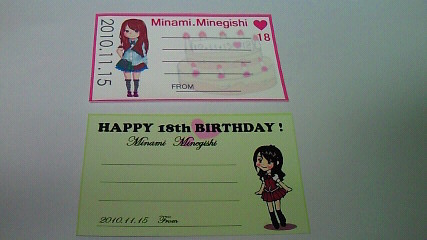 We are collecting the birthday messages for Minegishi Minami's 19th anniversary from foreign countries as like last year. A lot of messages were received from a lot of countries last year. It was Australia, the United States of America, France, Germany, England, the Netherlands, Spain, Canada, Indonesia, Malaysia, Brazil, Vietnam, the Philippines, South Africa,Colombia,Chile and it was very many. It made her very happy to receive your messages ! We hope to you join us and a lot of messages will be collected for her . We await your cooperation with 8 types cute cards. Your massage will be printd to them! Let's do it with us. and let's enjoy it ! You can write massage in English,and Japanese,and Chinese. We can translate Chinese to Japanese this year! it's good news! We've already received many masssages written in Chinese. 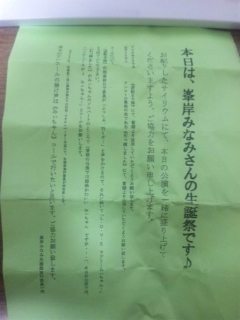 Please look at this post,the participation method is written. 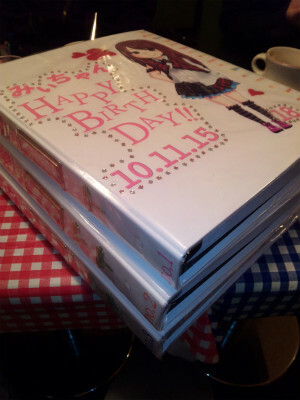 We have submitted the message card album of the Minegishi birth festival to the AKB48 theater today. It is possible to submit safely and above all though it is a delay for one week. A lot of cards gathered more than last year, and the squeal of delight exactly this year. It apologizes for taking time to edit and to decorate, and causing anxiety. Let's turn around for a moment in the photograph though it is such Minegishi a birth. We made such T-shirt for the first time in the history of the Michan birthday party. 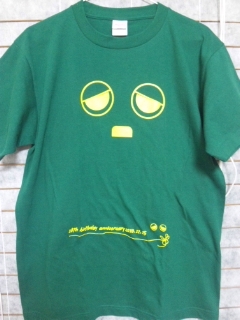 In front of T-shirt,It printed likas "Gachapin eyes" that called like Michan. It writes variously by the Chinese character behind. 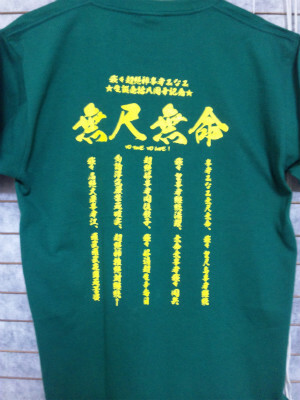 It is written variously behind T-shirt by the Chinese character. For instance, it is written, "Scale(Time?)". This is worries when Michan often appears on television. We adopted this Chinese character thinking of Michan who wanted to take the appearance time as long as possible in TV show. A lot of companions of us saw the performance of teamK on that day putting on this T-shirt. We were able to assist by seeing with ten companions at the center of the theater. It is a place in which, so-called "Tachi -saizen(Standing foremost)". It was very wonderful time. We presented her the stand flower as much as last year. 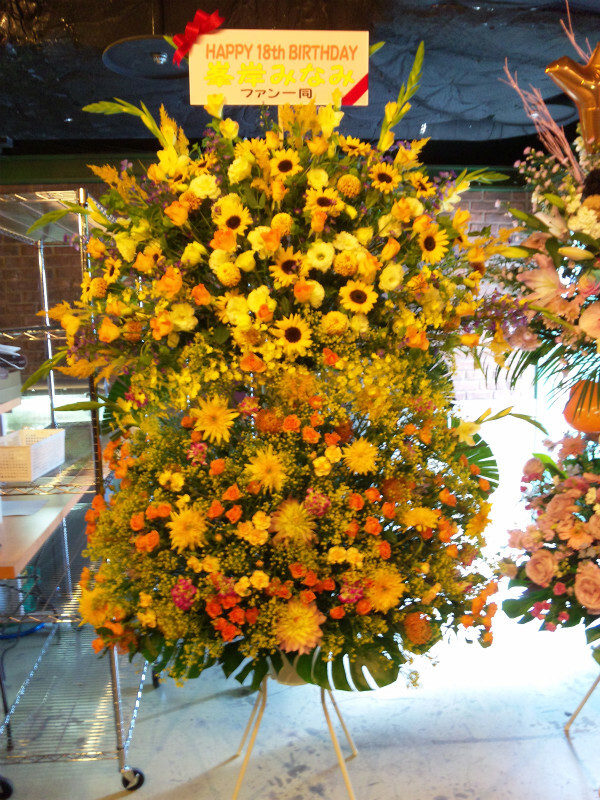 The flower based on yellow was presented to her. Two illuminants were prepared this year. One was Pink,the other was White. The first was used in "Gyakuten-Oujisama". Another"Hikkoshimashita. " Because it is the clothes colored Pink in the song of Gyakuten-Oujisama . "L･O･V･E LOVELY Michan" was called in the tune. ← and "Transcendence [kawaii]" were "Happy Birthday Michan" in the place in which it called it in "Moved" always as a matter of unpleasant necessity [Te] was called. The photograph is paper appended to [sairiumu]. It has submitted it today. The number of sheets that far finally exceeded last year gathered. We were able to collect 2163 birthday messages this year. Because a lot of cards had gathered, we were surprised, and were glad. 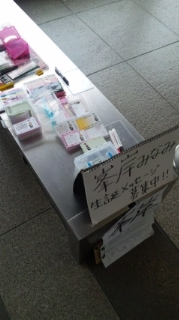 The card collection was done by such feeling in Makuhari Messe. It cooperated a lot. Thank you. And, a lot of messages were gotten excluding Japan. 19 countries!! How amazing is it!? It printed as it was because there was a person who had written in Japanese in the inside, too. It is a content that can be read of course usually. Kind of this year's card. After all, it became eight kinds. An overseas person made the card of the gray. It is the first attempt this year. It is all over the world a lot. The person who likes Michan. After all, the album became three. There are actually as many as three and it is heavy. Perhaps, it is not possible to take it home once for her. It is very heavy because there are a lot of numbers. When reaching her hand, she will surely put it on the blog with pleasure. 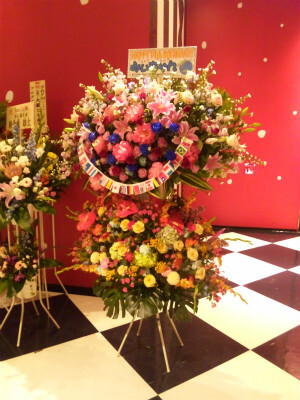 Expecting it, hereafter, there will be the AKB48 theater staff's check. However, it is thought that it reaches before Christmas. Therefore, it is likely to become a big stocking filler for her. 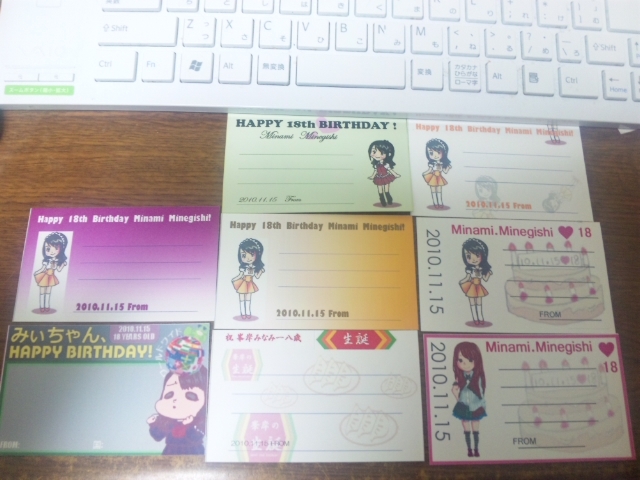 This year's Minegishi birth was such feeling. I think that it is very glad that the person of the fan from foreign countries also had a lot of interests. Moreover, when it will be possible to rise to such a wind next year, it is good. She is surely pleased, too. Thank you really for a lot of your cooperation. Birthday cards collection 2010 for Michan! 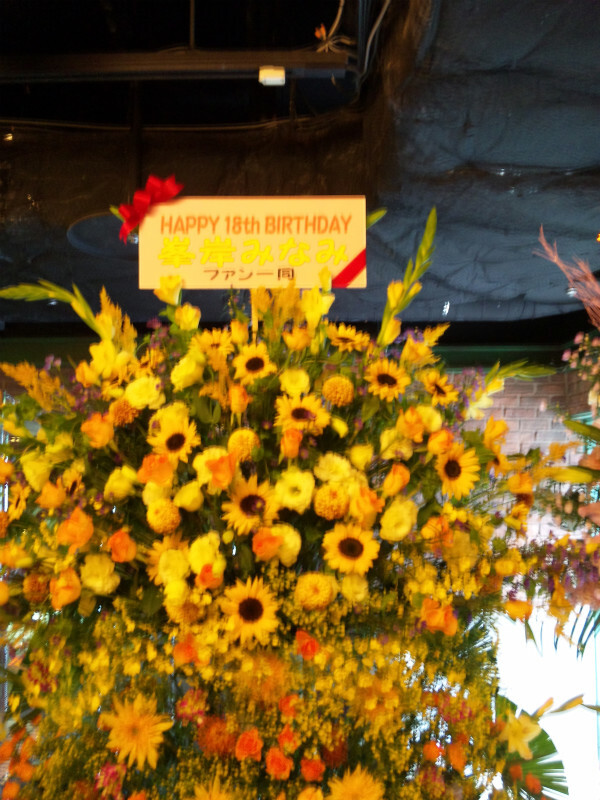 We are collecting the birthday messages for Minegishi Minami's 18th anniversary from foreign countries as like last year . A lot of messages were received from people in a lot of countries last year. Michan posted about them in the no3b blog. It was Australia, the United States of America, France, Germany, England, the Netherlands, Spain, Canada, Indonesia, Malaysia, Brazil, and it was very many. She was very very happy to receive their messages ! We are wishing a lot of messages will be collected for her . We await your cooperation,Let's do it with us. and let's enjoy it ! 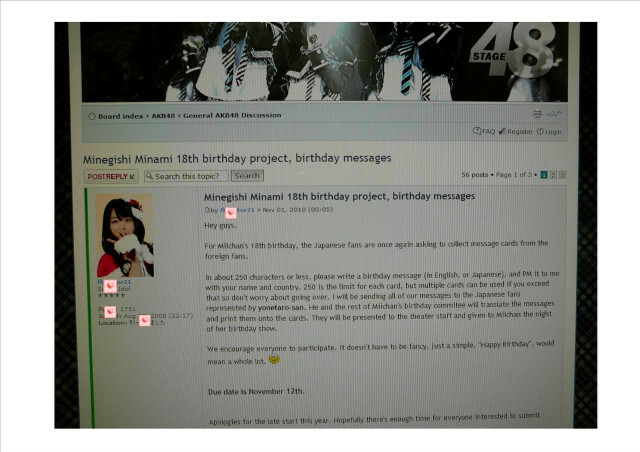 Nous elevons des messages sur les 18-annee-vieux anniversaires de vous a Minami Minegishi. Copyright © あい My みぃ++ AKB48峯岸みなみだけを見ていたはずだったにも関わらず All Rights Reserved.